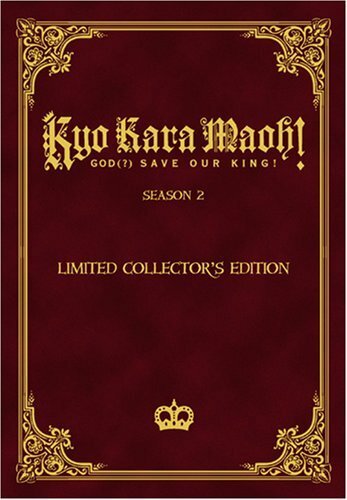 Home » Animegood Super Store » Kyo Kara Maoh! Season 2 DVD Vol. 01 DVD (Limited Collector's Edition) Brand NEW! Kyo Kara Maoh! Season 2 DVD Vol. 01 DVD (Limited Collector's Edition) Brand NEW! Kyo Kara Maoh! Season 2 DVD Vol. 01 DVD (Limited Collector's Edition) Brand NEW Factory Seal! Kyo Kara Maoh! Season II DVD Vol. 01 includes with Collectors DVD Case (Limited Collector's Edition). This is Collectors DVD Case hold 9 Discs. DVDs Sold Separately. Official Licensed Product, 100% Authentic Guaranteed. Spoken Languages: English Japanese / Subtitles: English Format: DVD Item Code: 013023289499 Running Time: 125 Minutes Manufacturer: Geneon Ages: 14 Condition: Brand new Availability: In Stock – Usually Ship within 2 days! We will not Guaranteed item will still have stock available (Special during Holiday) if payment not receive in 2 business day! All will be filled on a first come, first served basic. So, please make Immediate payment to avoid disappointment! If you have any question please contact us. We'll be happy to answer any questions. More information please view Seller policies section. Appreciated your kindly understand!